Though the shape of the MAMICUP is similar to other menstrual cups, there are subtle design details that might prove advantageous over other menstrual cups. The airholes in the MAMICUP have been placed higher on the cup. 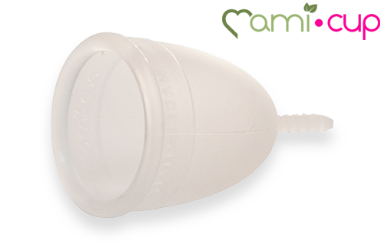 This means that the MAMICUP is a similar size to other menstrual cups but has a higher capacity. That means that you can choose a size that fits your body without worrying about whether it will be able to handle your heaviest flow days. Many women may find the MAMICUP more comfortable than other similar cups. That is because the material is designed to be softer and more elastic. Women who prefer softer cups may find it easier to insert or remove and more comfortable to wear. In addition to the cup itself being softer, the upper rim is also softer. This will mean it is easier to fold and may feel less pressure during wearing. They designers of the MAMICUP have considered what makes the cup easy or hard to clean. They found that the hollow stem is a major source of bacteria and blood, so they've given the cup a solid, flat stem. The stem does have ridges to facilitate removal, but overall the stem should be easier to clean than other similar cups. For the level of quality you will find in the MAMICUP, it is relatively cheap. MAMICUP is made in Italy with the highest standards in mind and it is certified at the UNI EN ISO 9001 level.